NECN, the nation’s largest regional news network, unveiled a new studio today after a year-long transformation of the network that included changes in management and numerous technological updates. 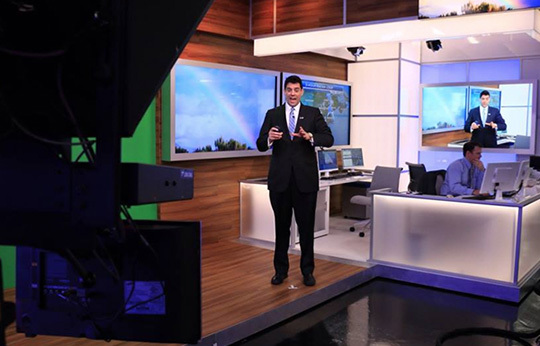 “Over the last year, NECN has gone through a complete revitalization with one goal in mind – to bring our viewers across New England the best breaking news and weather coverage possible,” said Mike St. Peter, SVP and GM of NECN. The upgrades include a brighter and more modern newsroom, enhanced news gathering equipment and a refocusing of the networks coverage on breaking news and weather. “Now that much of our work is complete, we invite all New Englanders to tune into the new NECN to see our in-depth reporting on the local stories that are matter most to them,” said St. Peter. 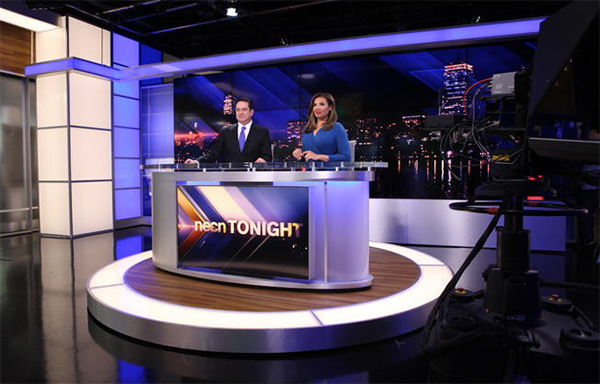 NECN broadcasts nearly 70 hours of live programming each week from its Newton, Massachusetts base, and is owned by NBC. The new set design mixes warm woods with backlit columns and plenty of technology. John Casey designed the environment, and it was lit by The Lighting Design Group and Senior Lighting Designer Mike Grabowski and Dan Kelley. A 5×3 monitor wall anchors the set with a small pod desk that rotates to offer different backgrounds, including a view of the newsroom. A working weather center includes three large monitors and workspace for multiple weathercasters. The upgraded newsroom includes multiple flash cam locations, such as at the Assignment Desk.